Princeton celebrates this amazing New Jersey town that has managed to remain quaint and charming while becoming a renowned center for education and research. The historic borough and bucolic township are seen in a panorama from Colonial-era Quaker farms to the hi-tech research boom of the 1950s and 60s in this marvelous new photographic compilation. The superb image collection of the Historical Society of Princeton has provided spectacular views of this famous community. Over 200 images and interesting text about the town and college fill the pages of this fabulous history. Along with photographs of landscape and locals are others of George Washington, victorious at Princeton after the most critical battle of the War of Independence, and Albert Einstein lounging on his porch in fuzzy slippers. Author Richard D. Smith is an independent journalist, researcher, and author who contributes regularly to The New York Times among other papers and magazines. 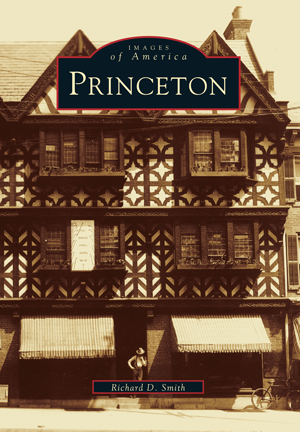 Smith's knowledge of Princeton from working and volunteering there shines through in this wonderful volume. It is sure to make an excellent addition to the bookshelves of historians, residents, and tourists.